Best bag to fit your garbage container. Cutest little bags to fit my round trashcan. Very easy to replace with secure hold. I love the product because it is strong and holds a lot. It fits so easily in the can. We only have to change it about every 5 - 6 days because it holds so much. Even though we cram a lot of trash in it, it still is easy to pull out and not break doing so. 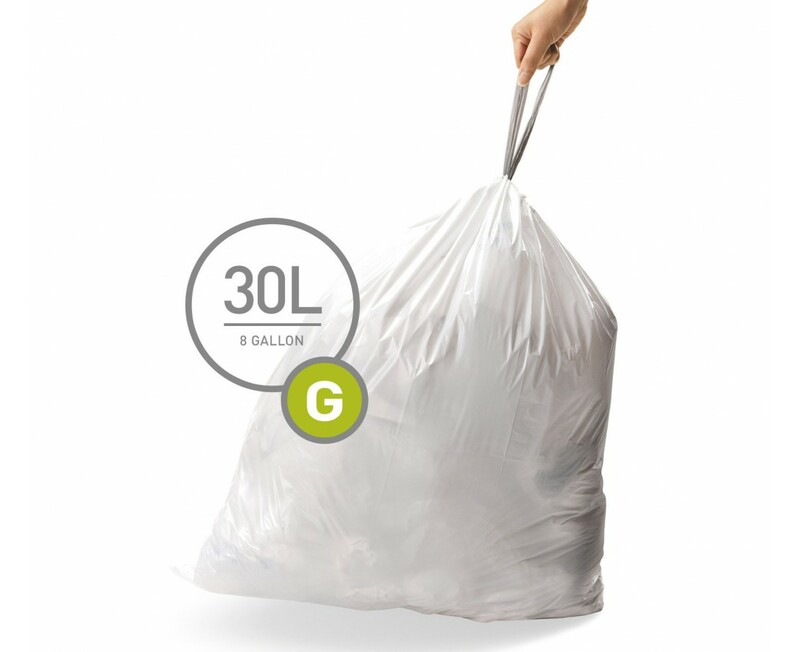 Bag fits perfectly into trash can, and you can lift it out easily when full of trash. I love the size and it looks nice in my kitchen. I thought these bags would be flimsy and not hold much garbage but they are just the opposite. I can stuff them full with days of trash and they don't rip or tear and hold everything you can imagine. I purchased a stainless steel trash can. It is stylish,easy to clean and sturdy. The can opens & closes easily but will also stay open when scraping off plates. The costum made plastic liners fit beautifully in the can along with being very strong. The bag can be pulled out of the can without concern of tearing! Wish I could buy the liners where I bought the trash can. the liners fit in the can very well - they are strong and durable - haven't had one break on me yet. I love my Simple Human trash cans, but found looking for the right size bag difficult - it always seemed that the only letter missing was the letter I wanted. By buying by bulk, I now have an unlimited supply of bags that fit perfectly. This is a well-made liner. It fits my trash can perfectly and is easy to install and remove. Simple Human is easy to work with and always sends my liners quickly after I make an online purchase. Great trash can liners; have not split open. Now that I recycle most of my paper products, this can and its bags make for a tidy style of handling the kitchen trash. It looks nice, and keeps products from smelling up the house. I do like it's size; it's never too heavy or voluminous.